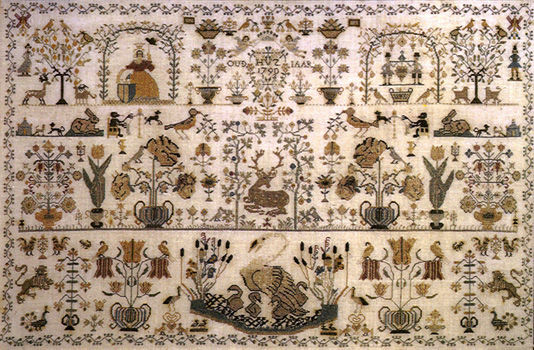 The original of this wonderful sampler was stitched around 1790 by a thirteen year old girl from the Low Countries. All we know about her is her initials HVZ. The historical sampler has 68 birds and animals. Permin of Copenhagen is a long established company well known for its quality. The kit has large scale black and white charts printed 10 stitches to approximately two centimetres. The pattern is in booklet form, on 21 A4 pages. The design is worked in whole cross stitch using 13 shades of stranded cottons on a stitch count of 630 by 390.